Our Sun is one big fusion reactor. Hydrogen atoms fling about throughout its volume. They sometimes hit each other, fuse, and, make Helium. Helium makes Oxygen. Oxygen fuses into Carbon. When two get together to make a third, the third has a little bit less mass. This mass loss appears as electromagnetic energy. The energy spreads somewhat unevenly across the infinite spectrum. But, the majority of it exists as visible light. Because of the fusion of atoms on the Sun, light energy, is thrown in all directions. Energy aimed toward the Sun gets absorbed by the Sun. Energy aimed away from the Sun continues on until it meets something sold. When we see stars at night, our eyes are stopping the light energy or photons that came from another fusion reactor in space. As our Sun is so much closer than other stars then much more light energy reaches us. This energy, known as the solar wind, acts very much like the wind that flows at the surface of the Earth. At the top of Earth's atmosphere, the Sun delivers 342 watts per square metre, non stop, and with very little variation. Next to nothing inhibits the Sun's energy from reaching the top of Earth's atmosphere. But, once the solar wind comes into the influence of the Earth, things begin happening. First, the magnetosphere directs some energy and particles away as shown in the following. 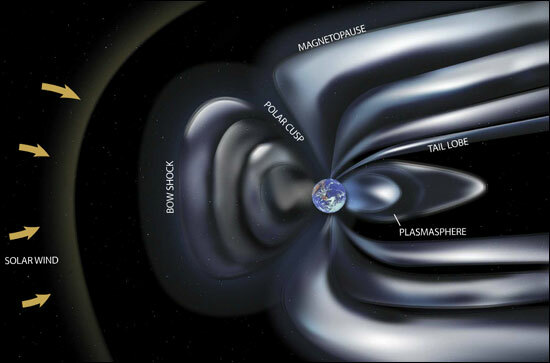 Though the magnetosphere greatly decreases the energy in the solar wind, some continues on toward Earth. But on encountering the Earth's atmosphere, again more energy leaks out of the wind. The following gives an idea of the average energy disbursement. No matter where we stand on Earth, we always say that the Sun is up in the sky. Just look up and the great yellow star will be shining down upon you. But, the amount of annual light or light energy is different for every different location on Earth. Locations on the equator are closer to the Sun and thus will have great values. Locations at either poles will have much smaller values as the Sun is never directly overhead and, for weeks at a time, can be completely absent. For the United States, the following shows the average annual solar radiation at ground level in kWh/m2/day. As to be expected, Alaska being farther from the equator, has low values of about 3 kWh/m2/day (avg of 11MW/day). However, places along the countries southern border which are also at high altitudes have the highest annual radiation of about 7 kWh/m2/day (avg of 25 MW/day). We need energy to power our bodies and our mechanical devices. We can't eat solar energy but we can collect it and have it do our bidding. Many different ways exist to do this. But, the largest solar powered electrical uses the well known process of using the energy from the solar wind to heat a fluid. The heat is transferred to water which becomes steam. The steam enters a turbine which in response rotates. The rotation generates the electricity as in the following. Though the Sun can feel hot, it's not enough to power this system. So, mirrors focus the Sun's energy onto a fluid, in this case oil, and the heated oil supplies the energy to heat the water. This is the technique used at a solar power electrical generating station in the Mojave desert of the Unites States as seen in the following. The following table has the value of the captured energy. In the above table, the gross annual solar is the four year average from 1998 to 2000 (see here). The nine solar collection sites produce an annual 654544 MWh from fields covering 890 hectares. Or, the sunshine on the ground annually provides 2715 kWh/m2 of which we capture 73 kWh/m2, about a 2.7% efficiency. Afterward, some electricity is lost through conversion, delivery and the final consumption by us, the consumer. Hence, we will never realize the full potential of the Sun but we can still benefit. The Sun provides 342 watts /m2 or 1.1e10 joules/m2 per year at the top of the atmosphere. But, the atmosphere greatly affects the solar wind so only a small fraction reaches the Earth's surface. As well, the Earth spins so only part of it receives solar energy at any given time. The better locations on Earth's land surface have an insolation of 7 kWh/m2/day or on average 25.2e7 Joules/m2/day or about 9e9 Joules/m2 annually. Using today's advanced technology, we can capture the Sun's energy and generate about 73 kWh/m2 annually. A typical refrigerator uses over 700 kWh per year. The people of the United States consumed over 3e13 kWh in the year 2007. The United States would need 4.2e7 hectares of equivalent solar collectors if the Sun was the primary source for all their power needs. This area is more than half the area of the complete state of Texas.